While I was in San Francisco for the last Event Apart of the year in December, Luke pulled me aside while he was preparing for his A Day Apart workshop on mobile web design. As befits the man who literally wrote the book on web forms and also wrote the the book on mobile-first design, Luke was planning to spend plenty of time covering input on mobile devices and he wanted my opinion on one of the patterns he was going to mention. With the introduction of the new input types in HTML5, we can now just use input type="month". 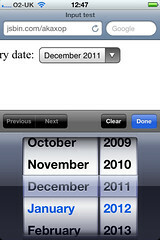 That’s particularly nice on mobile devices that support input type="month" like Mobile Safari since iOS5. But the behaviour on non-supporting browsers would be to display just like input type="text" …not ideal for inputting a date. So the pattern that Luke proposed was to start with the traditional double drop-downs for month and year, and then use feature detection to replace them with input type="month" in supporting browsers. The only downside is that some the desktop browsers that do support input type="month" do so in a way that—from a UI standpoint—seems like a step backwards from simply having two selects: Safari displays it with a spinner control like input type="number", while Opera shows an entire Calendar (days’n’all). Anyway, I threw a quick hack together as a proof of concept so you can see it in action. I’m sure you can improve upon it. Feel free to do so.